Kayaking can be a very relaxing activity for you, your family, your friends, or even your dog. However, not everyone has the luxury of living next to a lake or river. If you are someone that is in need of something to transport your kayak from your home, then you are in luck as we will be discussing the best kayak roof racks available in the market today. Hopefully, this review will help you find the best kayak car racks that will fit your specific needs. With the right kayak roof rack, you can take your kayak wherever you go with ease, safety, and style. Why Do You Need a Kayak Roof Rack? A kayak roof rack, simply put, is a rack which allows you to carry a kayak on top of your car. This is different from kayak trailers, as car top kayak racks are much more portable. Kayak trailers require ample space behind the car, which can make parking more difficult. On the other hand, kayak roof racks require additional vertical space, so going through areas with low ceilings may become a problem. The sections below list down our comprehensive kayak roof racks reviews so that you would be able to see if this is what you would like to use for kayak transport, and which one you would prefer based on your requirements. There are different types of kayak racks available, and each is suited based on different criteria. This would include what type of vehicle you have, what types of bars or racks are installed, what space is available to you, and how easy you would like to secure and remove your kayak. Here are the most common types of car top carrier for a kayak that are available, as well as brief descriptions on each. Temporary pads are basically foam pads that you can place on top of your car to support your kayak during transport and to prevent your car from being scratched. This is best for vehicles that do not have any type of rails installed but do not provide the best when it comes to security. Purchase these if you don’t intend on bringing your kayak along on a regular basis. Saddles are best for vehicles that already have crossbars installed, and for those who will be carrying large kayaks. Saddles are basically pads that are V-shaped rather than flat, with its purpose being able to support the entire width of the kayak. This provides more support and security, especially for larger kayaks. J-cradles are designed with space considerations in mind, as kayaks can be loaded on a 45-degree angle instead of upright. This will allow you to put more stuff on top of your car. You can also turn this into a double kayak roof rack if you want to carry more than one. 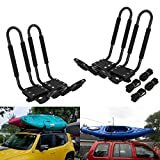 This type of kayak roof rack is best for lighter kayaks a well as lower vehicles as carrying a kayak on its side to and from the cradles may require more physical strength. Stacker provides ample space for stacking multiple light kayaks on your vehicle. This makes this the best kayak carrier for two kayaks, or maybe even more. Crossbar space consumed is limited, but very wide kayaks cannot be secured in this way. Vertical space is also required as kayaks will be stored sideways on top of the vehicle. Crossbars are metal bars placed parallel to the rails of the vehicle. This is where the attachments such as saddles and stackers are placed. Most kayak roof mounts will require that this is installed, although you can have aftermarket crossbars installed if you do not have one. Take note, though, of crossbar weight limits depending on the weight and number of kayaks that you intend to load. 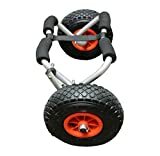 Rollers are systems that will help ease the loading of kayaks. As the name implies, all you have to do is place the end of your kayak on top of your roller and you can just roll it up to the rack. Rollers work in tandem with racks and cannot handle kayaks stored in a non-vertical position. When looking for the best rooftop kayak carrier, know that it is not a one size fits all affair. You should know not only what you want, but whether your carrier of choice is the best for your kayak and vehicle. Here is the list of things that you have to know and consider before doing your shopping around. Depending on the roof of your vehicle, you can attach different types of kayak roof racks. For bare roofs, pads are recommended, while those with rails may require to have crossbars installed if not are still available. With crossbars, you can install a removable kayak rack or just keep them always attached if you would be using them often. The type of your kayak is a very important factor when choosing the best kayak rack for you. Most of it would come down to size. Having a large kayak will require a rack that can accommodate not only the width but also the weight. This is especially important for smaller vehicles that may not be able to provide adequate support. If you are a frequent kayaker, then having your kayak racks fixed will be the best idea. However, for those who do not frequently bring their kayaks, having racks that can be attached and detached easily will be best. Note that some types of racks will also need other parts of your vehicle such as windows and doors, so complicated setups done frequently can feel like a chore. Some kayak racks have special features that will provide for different types of conveniences such as ease of loading and unloading, adjustments for differently sized kayaks, increased security, or added protection to your car. Look through special features and see which one appeals to you the best. There are different manufacturers of kayak roof racks, from cheap kayak roof racks to high-end ones. Price does not necessarily mean quality, though, but it is, however, important to get racks from manufacturers that have a good reputation in the market. The list below provides kayak car racks reviews from the best manufacturers in the business today. Compatibility pertains to both the kayaks that you are loading as well as the accessories already present in your vehicle. While you can install new rails or crossbars, you should know that they should be compatible with the racks that you have your eye on. Otherwise, you might waste your money buying something that will not fit with what you currently have. Kayak roof racks should provide protection to your vehicle, even under the harshest of conditions. As such, they should be able to provide adequate space between the kayaks and the cars, even if said kayaks are heavy or move around. Security and stability is very important, especially in a moving vehicle. A secure and stable kayak rack will mean that kayaks will not dislodge, preventing accidents or injury. Racks should be stable and secure even with strong winds or when traveling at high speeds. A kayak rook rack, no matter how user-friendly, will need to be installed. Sometimes, they would have to be removed as well, especially if they would not be used for a long time. Having a hassle-free process to remove and install will be very convenient, especially if there are no tools required and with minimal manpower required. Loading and unloading kayaks should be very easy and would require as little effort as possible. This is especially important after kayaking as you may have already spent the majority of your strength. A good kayak roof rack should be convenient to use and you should be able to load and unload your kayak quickly and safely. Picking the best kayak carrier was not an easy task. In our goal to find the best kayak roof racks, we did a ton of research and interviews to see which among them are the best ones available in the market today. We tested a few ones ourselves so that we could provide as honest a review as possible. The research was based on the specifications provided by the manufacturers of the most popular kayak roof racks on the market. 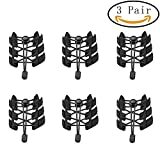 We have also scoured reviews from those who have purchased and used these items. Experts in the industry were interviewed so that we could get an accurate picture of how these roof racks performed. For our criteria, we based it on different factors which are discussed below. As you might have different needs when it comes to roof racks, we have listed down the best based on the category so that you can just skip through the ones that do not apply to you. Other options are also listed down so that you will have many more options to choose from. Of course, despite our rigorous testing and review, you might find something that you would like more. You might even have differing opinions from ours, but that’s okay as this would only serve as a guide for you to know more about what to look for when buying kayak carriers for car roofs. As such, you can follow our recommendations below, or make your own decisions on based on what you have learned. Here, we have categorized our best kayak roof racks. A detailed review, as well as specifications, has been included. Our review also included some advantages and disadvantages based on our research and our own testing. Hopefully, this would provide you with all the details necessary to make a smart and informed choice when buying a kayak roof rack of your own. If you want an easy load kayak roof rack, then the Malone Downloader Folding J-Style Universal Car Rack is the best available based on our extensive tests. The Malone Downloader quickly became our favorite as it took very little effort to attach and secure a kayak to this particular rack. This is because of the built-in boarding ramp which makes loading and unloading kayaks an easy one-man job. This will ensure that your kayak will stay in place even when going through uneven terrain. Aside from this, you can also purchase the MPG351 Telos Load Assist as this is compatible with the Malone Downloader. Why this type of technology would not be integrated, though, is anybody’s guess. As of compactness, the Malone Downloader weighs only 10 pounds but is capable of carrying kayaks up to 75 pounds in weight. The cradles can also be folded, allowing you to store more and clearing up your vertical space. The Malone Downloader is adequately padded with thick material covering all relevant areas, providing additional protection not only for your kayak but for your vehicle as well. The Malone Downloader includes load straps and buckle protectors for added security and protection. Lastly, the patented JAWZ mounting hardware promised that the Malone Downloader can easily be installed with almost all types of factory fitted crossbars whether they are rounded, square, or oval. We found this to be extremely helpful during our tests, and the 60 and 70mm mounting bolts included in the package really helped in completing a snug install for most, but not all, crossbars that were available at the time of testing. The Malone Downloader should be one of your top choices if you want a J-cradle. It is resilient, and while it will function great in a small car, it may very well be the best kayak rack for SUV, as well. It provides a fast loading and unloading process, and you don’t have to strain yourself with the boarding ramps attached. While there are some flaws to the “universal fit” label, it does cover the most common crossbar shapes. However, there’s nothing a simple phone call to Malone customer service to verify if the Downloader is right for your vehicle. The HandiRack Universal Roof Rack Bars are inflatable pads that take less than 15 minutes to install. It is made of durable material that is strapped on top of the car and inflated with a pump that comes with the package. One good point about the HandiRack is that it has a rated load capacity of 180 pounds. That is enough for two kayaks. It is also versatile as it can carry items other than kayaks such as coolers, camping gear, surfboards, or any other items that can rest on the pads during travel. One drawback, on the other hand, is the lack of built-in braces in the HandiRack. You would have to rely on very tight straps that you would have to fix from time to time, so you should expect some stability issues especially when traveling at high speeds. Still, the HandiRack is the best alternative that you have if you don’t want to install rails or crossbars on your vehicle. It provides adequate protection as a first option, but it doesn’t seem to be a viable long term plan for frequent kayakers. This, however, is great for those who find themselves carrying kayaks or similar large objects for just a handful of times a year, as the HandiRack can be easily installed and removed as needed. This is recommended for those who have not yet decided to have permanent crossbars installed. The HandiRack is also great for those who use multiple types of cars for transport as it can fit all vehicles up to 55 inches in width. The HandiRack Inflatable Roof Bars take the cake when it comes to versatility and durability, although it falls a little bit behind when it comes to convenience in loading and unloading kayaks. There’s nothing a few extra tight binds cannot fix, however. Buy the HandiRack if you do not have any fixed requirements or plans to invest in more permanent solutions. It is a great temporary solution, but should not be relied upon long term if you are a serious kayaker. For those who require kayak car racks for 2 kayaks or more, you should look no further than the Thule 830 The Stacker Kayak Rack. Based on our reviews, it is the best when it comes to carrying multiple kayaks at once, and since it is made in the USA, you can be guaranteed of its quality and durability. The Stacker can easily be attached and detached from crossbars as they are only screwed in, although you might need to check if this is compatible with your vehicle. The Stacker can be folded down if it is not in use, and it can support up to four kayaks with the total maximum weight of 600 pounds. Don’t expect it to be a one-man job, though, as the product does not offer load assist, and keeping your kayaks on their sides while you tie them down will definitely require a partner to accomplish. The Thule 830 is the most economical way to transport 4 kayaks, but it can be a very expensive investment if you would only be using it for 1 or 2 kayaks as there are other alternatives around that are cheaper. For maximum number and weight capacity, however, nothing beats The Stacker, although load straps for up to four kayaks should have been already included in the package and should no longer be an optional purchase. Still, this multiple kayak roof rack is your best bet if you want a durable, secure, and nicely arranged stack of kayaks on your car’s roof. Thule’s The Stacker should be purchased if you intend to carry at least two kayaks at a time. Otherwise, you’re better off looking for something else, especially if your budget is of any concern. The Stacker, though, at maximum capacity performed well, even with differently sized kayaks loaded. However, make sure that weight distribution is properly balanced to ensure safer travels. With balanced and secure kayaks, the Thule 830 blows everyone else out of the water when it comes to carrying convenience. The Malone SeaWing Saddle Style Kayak Carrier topped our rooftop kayak carrier reviews for the saddle category as it provided one of the most secure rides that we have experienced. The SeaWing has very flexible cradles that hug most kayak frames. This not only secures the base snugly but also minimizes drag, which in turn improves fuel efficiency. The SeaWing also has the patented JAWZ mounting hardware, which promises that it fits most if not all standard crossbars. Its low profile design also takes up very little space, allowing for up to two saddles to be placed on wider vehicles. However, you might be put off by the rocking motions of the kayaks during transport, but this is entirely normal. Loading straps with buckle protectors are included in the package, and these provide your racks with a very snug fit while still allowing for ample space to protect your vehicle from scratches and bumps. Despite not being foldable, it is unobtrusive and can be not removed even when it is not in use. At over 120 dollars, you can find a lot of other similar racks, but the Malone SeaWing wins the title for best saddle type roof kayak rack because of the safety and security that it provides. Rollers may also be needed to assist in loading, something that the SeaWing sadly lacks. For a classy looking rack that is very easy to install and requires very little effort when loading and unloading, this is money well spent for the convenience that it brings. The Malone SeaWing Kayak Carrier performed really well as it was able to carry our sample kayaks really well with a very little loosening of straps. Expect slight rocking movements, however, but that is completely normal. The SeaWing is one of the safest kayak racks that we have tested, even if it loading it can be a chore for smaller people without rollers. For transport safety, however, nothing beats the Malone SeaWing in its class, making this our top choice. One of the best kayak roof racks when it comes to price is the TMS J-Bar Kayak Carrier. Priced at less than 30 dollars per pair, the J-Bar is not made cheap. It is made of steel which provides a durable and stable frame for your kayaks, and adjustable foam pads on the rails will provide your kayaks with the added protection that it needs, regardless of size. The J-Bar can accommodate kayaks of up to 75 pounds and up to 36 inches wide. This is great for those who carry big kayaks across long distances as our tests have shown very good performance when it comes to stability even when traveling at high speeds. The TMS J-Bar also has a wide mouth not only to accommodate larger kayaks but also to make loading easier. Unfortunately, the rack does not provide a loading ramp which would have made the loading process much easier. For shorter people or those who lack physical strength, this may pose a problem. Designed to fit all types of crossbars, we did not have any trouble installing the J-Bar. However, you might experience some wiggle but, for as long as the rails are secure and the straps are tight, you wouldn’t have any issues about the kayaks dislodging during travel. If you have kayak transport needs but do not want to splurge on a rack, then the TMS J-Bar can address your needs. You can get top quality performance without burning a hole in your wallet with the J-Bar. With a sturdy design, stable frame, and a very low price, the TMS J-Bar Kayak Carrier is best for those who know how to properly load and unload a kayak but do not want to fully invest in the equipment needed. This is because loading and unloading will take some skill and strength as most J-style kayak racks do, but you will definitely get what you pay for with this product. Besides, you can always ask for help that should come free. A kayak rack review would not be complete without the Thule 898 Hullavator Pro Kayak Lift System. A play on the word “elevator”, the Thule 898 Hullavator basically elevates your kayak from the side of your vehicle up to the roof. Gas struts allow for an easy loading and unloading process as it takes up to 40 pounds off the kayak’s weight, allowing you to easily push and pull as needed. The Hullavator is capable of carrying hulls up to 36 inches wide and up to 75 pounds, although not all hull sizes can be accommodated securely. When strapped down, you can really feel how well kayaks are stored, making travel easy and convenient even with heavier kayaks. Eight padded areas ensure a snug fit as well as protection for your vehicle against scratches. The Hullavator is also beautifully constructed with both sturdiness and anti-corrosion in mind. It can be quite difficult to install, though, but the actual cradles can be easily removed once the entire frame has been attached. Of course, this means that the cradles themselves can be open to theft. In this regard, locks can be purchased for an additional cost. The Thule Hullavator also fits most crossbars with different mounting options available. The Thule Hullavator is one of the most expensive kayak racks that you will see, but it is well worth the price as literally anyone can perform loading and unload with ease. Eyes will definitely be on you as well as this is one of the most visually appealing racks that you will see out there today. If you want unparalleled ease in loading and unloading, then look no further than the Thule 898 Hullavator. Storage and removal take seconds, and even a child can safely use the rack. It also provides superior security on top of the convenience, giving you the best of both worlds in the process. The price may put off some people who are concerned about their budgets, put the regular kayaker will surely be able to make the Hullavator worth the money as it was constructed and built to last. If you would look at dual kayak roof rack reviews, you might not find the Yakima Jaylow Kayak Carrier among them. However, know that the Jaylow can definitely carry two kayaks at a time due to its innovative design that allows you to carry one kayak J-style or two stacker style. The Jaylow can also be folded so that it will save up on vertical space when not in use. Extra paddings in the Jaylow allow for a snug fit for kayaks and provides added protection as well. The package comes with straps and tie-downs that are good for one kayak only, so you would have to buy additional straps if you need to carry more than one kayak around. While the fits for two kayaks are snug, our test has shown that traveling at high speeds may cause the structure to emit a high pitched noise due to wind passing through it. It’s quite negligible, though, especially with the windows rolled up. The Jaylow Kayak Carrier is compatible with most crossbars, but you would have to be a bit creative in tying down your kayaks in some cases. That’s a small price to pay considering the flexibility and adaptability of this rack. Priced at around 200 dollars, the Yakima Jaylow is not cheap, but as it is built to last, this can be considered as a good buy especially for regular kayakers that love to travel. As it is also highly compatible, you can easily detach and install the structure to another vehicle if ever you would be purchasing a new car somewhere down the line. The Yakima Jaylow is a good buy for long term use, and it is best for those who are looking towards buying another kayak in the near future. It is highly adaptable and you would not have to purchase anything new aside from new straps should you decide to carry two kayaks instead of only one. It also provides ample space between your kayaks and your car, so you are sure that they will be free from damage during loading and unloading. An upgrade to Malone’s J-carrier, the J-Pro 2 employs enhancements that prove better kayak support. These include additional foam paddings and a more flexible cradle that will allow it to carry a wider range of kayaks up to 75 pounds. The Malone J-Pro 2 also employs its JAWZ mounting hardware along with bolts that will allow it to fit most if not all types of crossbars. Tie-downs and buckle straps allow you to safely secure your kayaks at high speeds and even in the harshest of driving conditions. This rack allows for more convenient loading as well due to an integrated boarding ramp. As such, sliding kayaks into place will be possible allowing for an easier loading process. The J-Pro 2 is not only built to last with corrosion resistant steel, but it also comes with a lifetime warranty. Many have reported usage of up to five years without any problems, which is a testament to the quality of this product. One main gripe on the Malone J-Pro 2 is that the cradle cannot be folded. Due to its height, the best option is to remove them entirely if they will not be used for an extended period of time. Although quite easily detachable, the added time to do so may put off some people who don’t want to do the extra work. Still, this is an amazing product that deserves to be included in our list not only because of its performance but because of the lifetime warranty that guarantees you long term usage and customer support. The Malone J-Pro 2 provides you with utmost peace of mind if you want to buy items that will last you for a long time. Not only is it corrosion resistant, but the lifetime warranty is something that should definitely appeal to you. Its adaptability to all types of crossbars is also great as you can remove it and install to a new vehicle should you switch cars. As such, this is the wisest purchase that you can make among the list if longevity is your primary concern. Loading or unloading your kayaks from your vehicle may be difficult, especially if you have cars with high roofs, but luckily the Rhino-Rack Universal Side Loader can help in making the task much simpler. Serving as an attachment to all types of crossbars, the Rhino-Rack Side Loader allows a person to single handedly load even the heaviest of kayaks with ease. The Rhino-Rack is specially designed to help you load not only kayaks but other lengthy items as well. Its durable frame allows for up to 44 pounds of weight, while support poles can increase that limit to up to 132 pounds. It is also designed to minimize slippage, which can cause injury or damages. Sadly, that is pretty much all that the Rhino-Rack can do as it does not help when it comes to transport. It is simply a portable and efficient mechanism which allows for easier loading. While some may think that this is not worth the money, shorter people and those who are not powerful enough to lift heavier kayaks can surely benefit from this contraption. The Rhino-Rack Side Loader is best used with temporary pads, as it might interfere with some kayak frames. 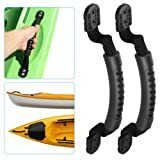 This device is also very easy to use and is great for beginners that are still having trouble with handling their kayaks. While some pros may not require this, taking the Rhino-Rack along can definitely save you time and effort especially after a long tiring day of kayaking. To be honest, you can probably live without this product. However, the Rhino-Rack Universal Side Loader deserved to be in our list in our opinion as it provides great convenience to those who find lifting kayaks difficult. It is a cheap and effective way to load kayaks, and it doesn’t hurt that it can be removed just as easily each time it is being used. Quick release straps and push button locks also make it a secure way of loading kayaks without the risk of damage or injury. The brand may not be that well known, but know that the universal kayak/canoe roof rack is a quality product. Not only is this built up to spec to be able to carry up to 250 pounds, but it is also highly customizable which allows it to be used against both kayaks and canoes. It also comes with multiple carriage bolts and other components that can be used to attach to crossbars of different shapes and make. Along with strength and durability, the AA-Racks J-Bar is properly padded and can be adjusted depending on the size and shape of your kayak. The base is also padded for additional protection and increased friction so that your kayaks would not move around when traveling. 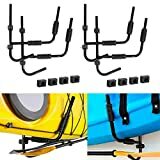 The AA-Racks J-Bar is very cheap, and you can purchase more than one if you want to carry two kayaks on your roof. Of course, you would have to consider the width of your vehicle before doing this. The J-Bar does not fold, unfortunately, which can pose as an inconvenience considering that the cradle is over a foot high. It also does not have boarding ramps so some may find it difficult to load. For its price point, the AA-Racks Universal J-Bar is well worth the price for a no-frills product that can definitely serve its purpose. This is best for large kayaks and canoes as well as for those who are on a tight budget. For that reason, this item deserves a place in our list of the best kayak carriers for cars. The AA-Racks J-Bar is very affordable and bare-bones approach to carrying kayaks. Those who want a transitional kayak rack can do well with this until such time that they would like to upgrade. Get this if you are just starting out with carrying your kayak around, or use this as a backup that can be installed on your secondary vehicle. While kayak car mount systems can do their jobs as advertised, you should follow certain rules to get the most out of them and to ensure that your kayaks are safely secured throughout your trip. Follow the instructions below to assure yourself of a convenient loading and unloading process. Before loading, check that all screws and straps are tightly secured. Ensure that foam pads are placed where the kayak will make contact with any surface of the carrier or vehicle. Use additional foam pads if necessary. Attach straps tightly and securely. If needed, add pads on points of contact as well. Add straps aside from the ones included in the package if necessary. Drive carefully and take into consideration the added size and weight of your vehicle. It is also very important to consider purchasing the right racks for your vehicle, your crossbars, as well as the kayaks that you will be loading. That is what this review is for. If still in doubt, you can ask manufacturers or online community boards for the product that will fit your requirements for a safe and worry-free journey. Here, we have provided you with a comprehensive list of the best kayak roof racks that are available to you today. Hopefully, our kayak car top carrier reviews would have provided you with all of the information that you need about kayak roof racks and which ones you should be shopping for. Our personal favorites in this list are the Thule 898 Hullavator and the Yakima Jaylow, the former for its ease of loading and unloading, and the latter for its flexibility to switch between J-style and stacker modes. Of course, you might have your own preferred racks included within the list, and maybe even who have not made the cut. Bottom line, you should definitely go with the products that you want, although knowledge on what works and what does not will help you get the best kayak rack that will fit your specific needs and preferences.